All I can say is WOW! What a first day. I hunted Ken's tree and had two bucks in early. One of the bucks made a rub right under my stand and less than 3' from the tree steps. Another 40 mintues went by when I saw a deer approach. He was a really nice buck. 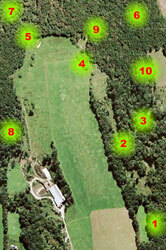 An eight with a busted G1, good mass and very good width. I thought about it briefly but passed on him. He was better than some of the deer I've shot here before but I am trying to set the bar higher for 2008 (see how long that lasts). Watch Video - Would you pass him up? The rest of the morning was pretty slow. Temps headed into the 60's and the wind shifted toward a poor direction. My buddies also had some action. 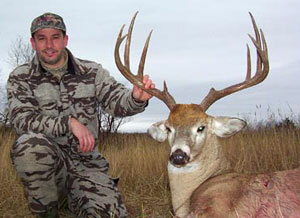 Gregg Hammell from Higganum, CT passed up a buck that approached 140 and Bill saw 4 different bucks but no shooters. 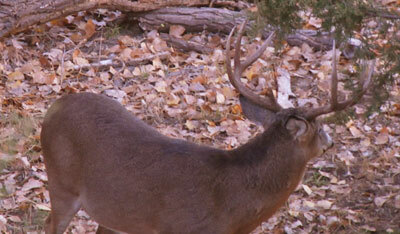 There was talk about a buck that was seen a couple of times from the river stand the week before last. But he had not been seen by the past weeks' bowhunters. 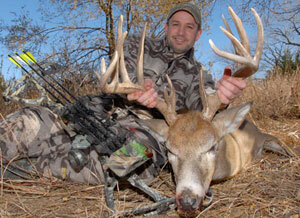 The hunter had video taped him and guessed him into the 170-180 range. The stand is called the River stand and that's where I headed this afternoon. The wind was perfect for this stand and although I thought the chance of seeing that big buck was slim, I couldn't help but give it a try. At 4:30PM I saw a deer approaching from the west heading north. As he got closer I flipped on my video camera and zoomed in on him. It was the same buck! 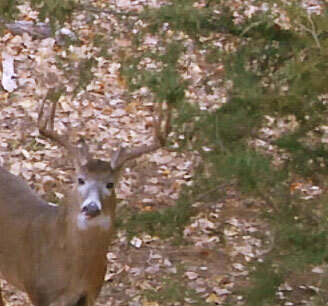 My heart started pounding and for a moment it appeared like he was going to head down the trail next to my stand. But he continued north and out of sight. He is magnificent! By the end of the hunt I saw 20 different bucks with 10 in range and 5 that would be shooters next year. There was a lot of chasing and even a brief fight. It was fantastic. 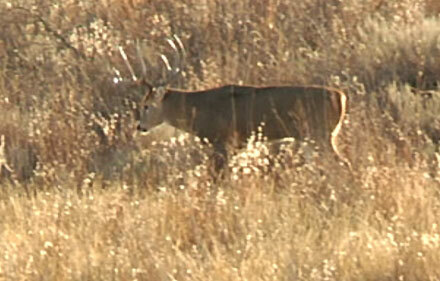 In truth, after seeing that buck this afternoon it will be hard to shoot anything else. I'm debating whether I should focus entirely on this deer. He is probably one of the top 3 largest deer I have ever seen. 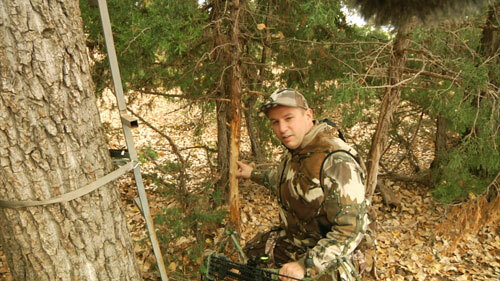 Click here to see the answers to last week's treestand Challenge Game. 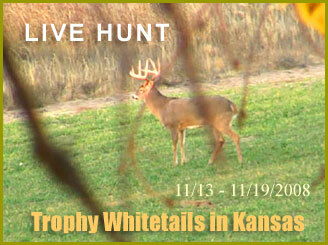 The winner will be announced at the end of this LIVE HUNT. Good luck! 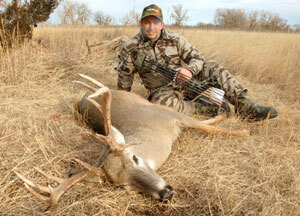 For seven straight Years I have killed a PY-Caliber buck from this amazing hunt in South Central Kansas. Let's see if 2008 doesn't dissapoint. This hunt is strictly a fair-chase hunt. The land we are hunting are large tracts of private lands owned by Kent Jarnagin and Kent Woolfolk of Cimarron River Outfitters. 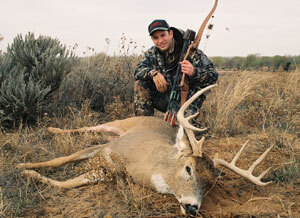 Hunting Gear - 60lb, Bowtech Guardian with Full Metal Jacket arrows and a Muzzy MX-3 Broadhead. 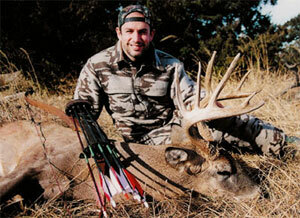 Hunting Gear - 60lb, Bowtech Allegiance with Full Metal Jacket arrows and a Muzzy MX-3 Broadhead. 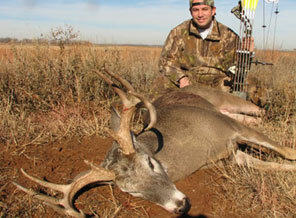 Hunting Gear - 60lb, Bowtech Allegiance with Beman ICS arrows and a Muzzy 125 head. As always, we will be bringing the hunt to you as it happens, day by day. We are in a very rural section of Kansas so some delays possible.